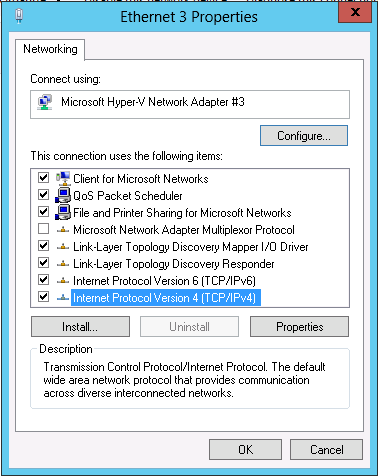 Before you can join your computer into Active Directory, we need to do some changes in the networking settings. Namely we’re just adding DNS server you created during Active Directory creation. This is done from the Server Manager, choose a Local Server and then your Ethernet configuration. It’ll open up your Network Connections. Choose the one there, right-click it and open up the Properties. Choose IPv4 and select settings, which will open up the TCP/IPv4 Properties. 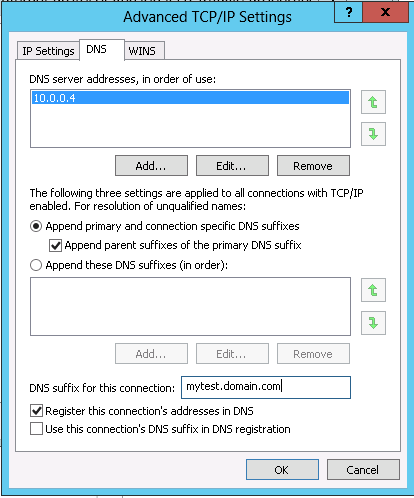 Here you can add your DNS server manually. Then click Advanced, in the Advanced properties choose the DNS tab and enter into DNS suffix for this connection field your DNS suffix, then click OK twice and finally close. 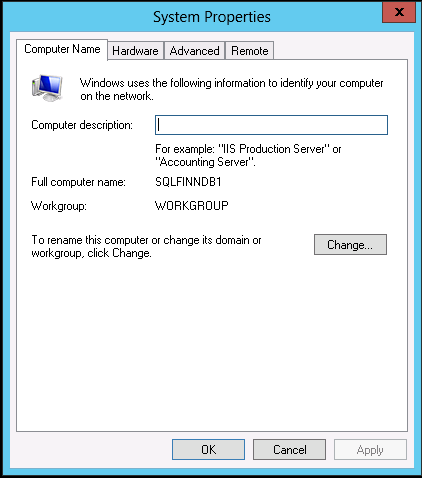 Joining Windows Server 2012 server into a domain is rather simple. 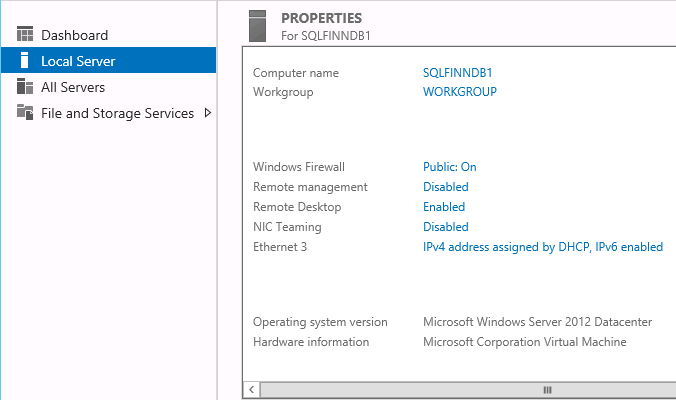 Start up your Server Manager again, go to Local Server and click on the Workgroup. In the window called System Properties, there’s a button called Change in the Computer Name tab. Click it. 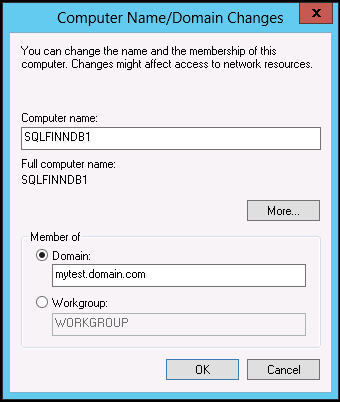 Choose Member of Domain and enter the FQDN name of the Active Directory you created previously. It’ll ask for you Domain Administrator account and Password next, enter them and hit the enter. If you did remember your account and password, you should be seeing something like this. Your server will want to reboot after this operation. 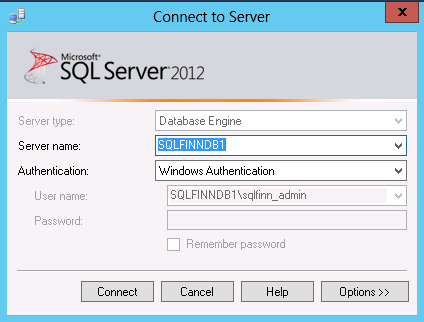 Log in using your local administrator account (your Domain account wont be able to log into SQL Server). Once you’re logged in you can download your favorite testing database in there. Personally I like to use AdventureWorks, which you can download from CodePlex. There are datafiles available as well as a full database backup, whichever works for you. There’s also an OLTP and DataWarehouse to choose from, again pick the one you’d like to try out. One of the reasons I like AdventureWorks is, that there are plenty of examples and other material available from Microsoft to play with. After your download is completed and you have copied your datafile (or your backup) to proper location, fire up the Management Studio and either restore or attach your database. After your database is available, it’s a good idea to run DBCC UPDATEUSAGE, sp_updatestats and finally DBCC CHECKDB on it. And there it is, your own SQL Server test environment on Azure. Part 1: Create Azure Network and Storage. Part 2: Create Virtual Machines and Active Directory.